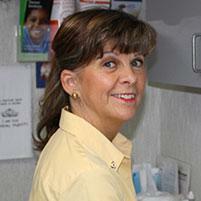 Diane has worked in the dental profession for nearly 40 years. She received her Bachelor of Science degree from the Columbia University School of Dental Hygiene, where she majored in Dental Hygiene. Diane also has a Master of Arts degree in Criminal Justice. She lectures on forensic dentistry and is a member of the Disaster Mortuary Operational Response Team (DMORT). Diane is also a board certified coach, a hospice volunteer, and a Court Appointed Special Advocate(CASA) for kids in foster care.